But I could breathe again right after opener “Sail On”, a rocker that sounds like Deep Purple with a pop groove that gets right inside your skull immediately. The following song, “Living For The Nighttime” makes me even more sure that this album is a winner. It’s a swinging little rock groover with a big chunk of both west coast and pop and the song is fantastic. “Stiletto” is just magnificent with its influence of pop, funk and even 70’s disco over the rock foundation that brings both diversity and shape. It is also so catchier than catchy. They keep both funk and pop for “Lady Jade”, but adds a large dose of Deep Purple around Stormbringer (1974) which will make this tune a live killer in the future without a doubt. “I Ain’t Young, I Ain’t Old” is both AOR and pop and borders to a ballad, but has more tempo. It has a contagious melody which will make this a great single some time. I would release “All The Ladies” – a brilliant rock tune that holds early 70’s Kiss and Alice Cooper together with a lot of 70’s pop poured in the mix – as a single as well because the damn thing is catchy as hell. One of my absolute favourites here is “Spanish Ghosts”. It’s darker and heavier and a bit on the progressive side that rolls on a slower pace with ballad tendencies and a cool keyboard arrangement and some really awesome Spanish guitars – the sky really is the limit for these guys. “Demon Princess” takes yet another turn where they add some symphonic gestures to the melodic groove of this progressive, 70’s based hard rocker – and the result is brilliant. The title track surprises us with being a short instrumental, soft with some jazzy undertones and it works like a charm. “Roads Less Traveled” is a smiler, an uptempo pop rocker with a whole lot of 70’s radio rock on top of it – if this song don’t make you smile you are beyond all help. “The Heather Report” (what a brilliant title!) finishes the CD – if you buy the standard version, that is – and the song starts out as a slow, blusier number, but ends in a more recognizable Night Flight Orchestra way and also holds a break that reminds me of Paul McCartney’s “Live And Let Die”. But you won’t be satisfied with only the standard version, no, you need the digipack version because, see, it contains “Floridian Eyes” and you really do need to own that song. It actually sounds like an outtake from their debut, a big swinging pop song that makes you think of warm summer days, beautiful women and convertible cars in which you drive with the wind running through your hair. It also makes me think of cold beer. The song is fantastic, in case you were wondering. So, are there any need for worrying for fans of the debut album, then? No, way, I say! Have they managed to better the last album as well? Well, I’m not sure, this album is a bit too new to make that kind of judgement yet, but it is just as good, in my opinion. It might sound funny that this album gets the full bounty when the last one “only” got a 9/10, but as I wrote above, the debut has kept growing on me since I first heard it and it should have gotten the 10/10 rating – it would have had I reviewed it today – or two years ago even. If you liked the debut, then you can buy this unheard without any hesitation at all. There is so much quality within this band it’s jaw dropping. The fact that this band isn’t already huge is both a mystery and a crying shame because they really deserve to be. 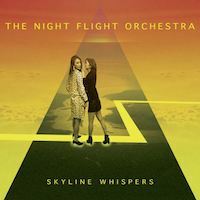 Also, the members of this band should make it their main priority because Night Flight Orchestra are superior to the members’ first bands. Could this be the album of the year? I dunno, but it is a hot runner-up for the spot and the 10/10 rating is indisputable. Buy now! Yes it is, isn’t it. Spread the word!